Oklahoma City, OK, February 17, 2015: Today, the Oklahoma Public School Resource Center (OPSRC) and GreatSchools launches GreatSchoolsOklahomaCity.org, a new website that gives parents accessible information on schools in Oklahoma City. This allows new residents to more easily find matches to their children’s needs and preferences and current residents to access more in-depth information about their schools. Parents will be able to discover schools suited to their family needs by searching for academic quality, transportation services, programs, or extracurricular activities of interest. Mayor Cornett, Mr. Bushey, and Leo Olebe, Vice President at GreatSchools will join the OPSRC today to showcase the new resources that the site offers parents. Last year, nearly 100,000 unique visitors among 33,000 households in Oklahoma City used GreatSchools to inform their choice of schools. The new site will provide additional and specific information about schools — including reviews by other parents — and important district and community news. In partnership with the OPSRC, the GreatSchools Oklahoma City initiative is example of GreatSchools’ work to help parents make informed decisions about their children’s education, offering not only information on schools and districts, but also parenting advice, educational activities, enrollment information, and other resources. Every year, over 59 million people visit GreatSchools.org to find the best possible match for their children’s needs. The Oklahoma Public School Resource Center supports quality public education in Oklahoma by providing resources, expanding network opportunities, and advocating on behalf of public schools. Membership in the OPSRC is open to all public schools in Oklahoma. While all public schools are welcomed, we are particularly focused on meeting the needs of rural public schools and charter schools. Both of these types of schools typically lack a large central/administrative office typically found in larger schools and the technical services offered by the Center are tailored to help address the administrative challenges facing such schools. Founded in 1998, GreatSchools is a national nonpartisan nonprofit that helps millions of parents find great schools, support great learning, and guide their kids to great futures. The Webby award-winning website, GreatSchools.org, is the nation’s leading guide to preK-12 schools, with profiles of about 200,000 public, public charter, and private schools and more than one million ratings and reviews by parents, teachers, and students. In addition, GreatSchools offers thousands of articles, videos, and worksheets to help parents support their children’s learning. Last year, GreatSchools had 59 million unique visitors, including more than half of all U.S. families with school-age children. Headquartered in Oakland, California, GreatSchools has local programs and offices in Indianapolis, Milwaukee, and Washington, DC. INDIANAPOLIS, IN, October 23, 2014: Today, Indianapolis Mayor Greg Ballard and GreatSchools announced the distribution of the 2014 Indianapolis school guide and Greatschools.org/Indianapolis. The website provides a one stop shop for parents to gain better information to help with the selection of a school that will fit the needs and preferences of their children. New to the site is an addition of innovative filters that help narrow down the search. Parents can now discover schools by searching for transportation services, programs and extracurricular activities. 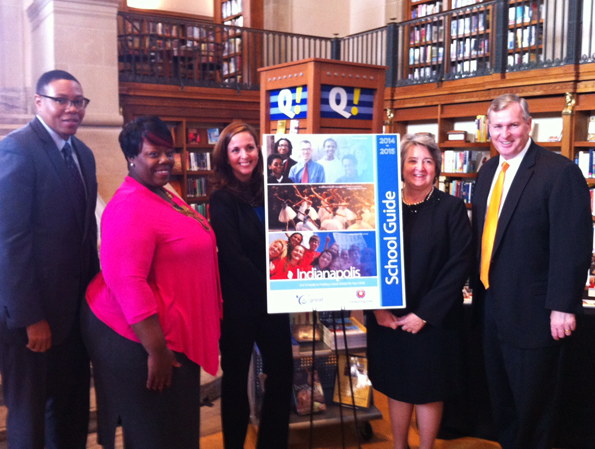 Mayor Ballard and GreatSchools Vice President Candice Santomauro will join Indianapolis Public Schools Superintendent Dr. Ferebee and Jackie Nytes of the Indianapolis Central Library today to talk about the new resources for parents. Last year, over 10,000 families in Indianapolis used the printed guide to support their school selection and more than 125,000 people looked for information about Indianapolis schools on GreatSchools.org. 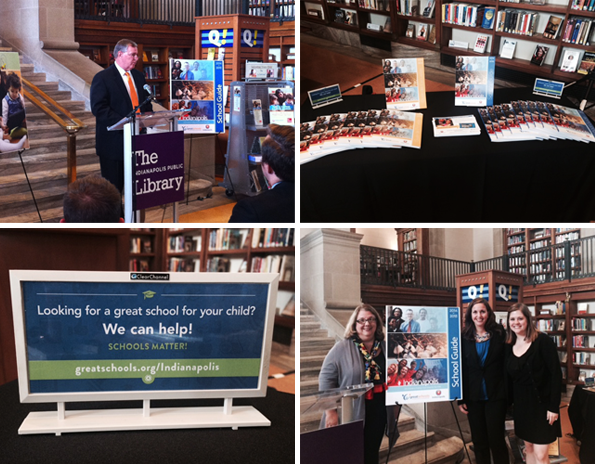 Under the leadership of Mayor Ballard, the GreatSchools Indianapolis initiative builds on GreatSchools’ longstanding work to help parents make well-informed decisions about their children’s education. Every year, over 55 million people visit GreatSchoools.org to search for a school, get parenting advice on a range of topics, and find new activities and resources to help make their children’s education great. In the fourth of our series, Emotional Smarts: Conversations on Parenting, two experts share their secrets for banishing bullying: helping parents know how to protect their kids whether in school or online. We’ve all heard the stories on the media and sometimes over the kitchen table. But what’s a parent supposed to do about this “national epidemic” that strikes so close to home? In honor of National Bullying Prevention Month, GreatSchools and Social Moms have invited two of the country’s most informed experts to help parents understand what they can really do to prevent (and stop) bullying in their own child’s life. Join Emily Bazelon, author of Sticks and Stones, and Maurice Elias, author of Emotionally Intelligent Parenting, in conversation with GreatSchools Executive Editor Carol Lloyd to explore the myths, tips, and best practices around bullying that every parent should know. 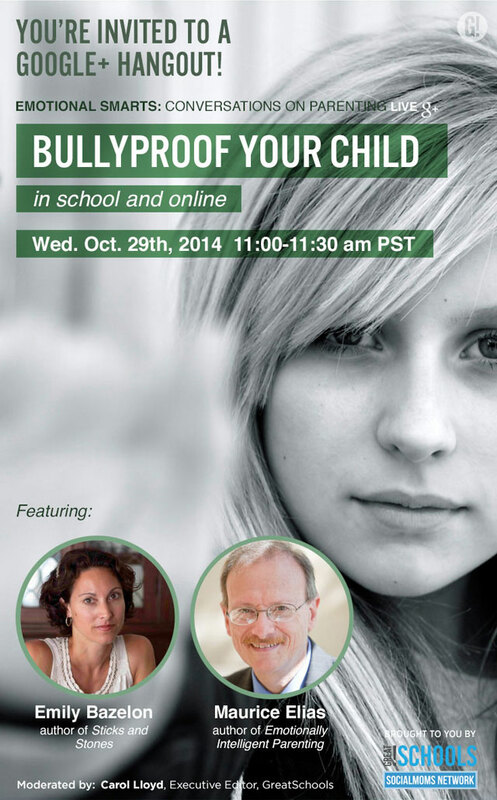 Join us on Wednesday, October 29 — and jump in with your questions — for a discussion on how to bullyproof your child. Join our #emotionalsmarts live chat on Twitter. How does our Google+ Hangout work? Just sign up via http://bit.ly/BESRSVP and add your questions, then log on at 11 am PST Wednesday, October 29th to participate. In this unique forum, you’re invited to join the video conversation by contributing advance and real-time questions and comments via the Google+ Hangout page or via Twitter using the hashtag #emotionalsmarts. If you can’t make the live event, no problem, you can watch it later on GreatSchools or SocialMoms. GreatSchools, SocialMoms, and social emotional learning consultant Jessica Berlinski created the Emotional Smarts series of Google+ Hangouts to bring together some of the most insightful voices in parenting, education, and other fields to talk about developing emotional intelligence in our kids — and ourselves. Our past hangouts have included a chat about dealing with anger in the family with America’s Supernanny Deborah Tillman and Marc Brackett from the Yale Center for Emotional Intelligence, a discussion of the benefits of letting kids fail with former NBA star Adonal Foyle and NBC parenting expert Michele Borba, and inspirational ideas for a happy school year with family happiness gurus and authors Christine Carter and Bruce Feiler. For each hangout, we pair experts with divergent views to explore a common parenting theme and offer practical wisdom and tactical advice. Emily Bazelon is a staff writer at the New York Times Magazine, the Truman Capote Fellow for Creative Writing and Law at Yale Law School, and a former senior editor at Slate. Her groundbreaking investigative journalism (and knack for storytelling), coupled with her extensive legal knowledge, make her one of the leading authorities on the shifting landscape of bullying in the cyber age: What constitutes bullying? What can parents, teachers, and educators do about it? What role can personality traits — such as grit, character, and empathy — play in overcoming childhood trauma and finding social success? Her 2010 Slate coverage of the suicide of Phoebe Prince, a Massachusetts high school student whose suicide was linked to bullying, was a finalist for the 2011 Online Journalism Award from the Gannett Foundation and the 2011 Michael Kelley Award for “the fearless pursuit and expression of truth.” She has spoken to audiences from the Aspen Ideas Festival to the Texas Bar Association to TEDxWomen. She is a frequent guest on The Colbert Report. She has also appeared on Today, PBS Newshour, Morning Joe, Fresh Air, and All Things Considered. Her writing has appeared in The Atlantic, O: The Oprah Magazine, The Washington Post, and Mother Jones. Her book, Sticks and Stones: Defeating the Culture of Bullying and Rediscovering the Power of Character and Empathy, has won widespread acclaim since its release in 2013 and was featured on the cover of the New York Times Book Review. Maurice Elias, Ph.D., has been with the psychology department at Rutgers for more than 25 years in many capacities. His research focuses primarily on clinical, school, and community psychology, particularly in the area of children, adolescents, and families; design and evaluation of preventive interventions; social, cognitive, and behavioral competence; and emotional intelligence. Dr. Elias’ multiple distinguished roles include director of the Rutgers Social and Emotional Learning Laboratory and director of Rutgers Civic Engagement and Service Education Partnerships Program. Dr. Elias has co-authored several books. His latest books include Emotionally Intelligent Parenting: How to Raise a Self-Disciplined, Responsible, Socially Skilled Child; Community psychology: Linking individuals and communities; Bullying, victimization, and peer harassment: A handbook of prevention and intervention; Urban dreams: Stories of hope, resilience, and character. Carol Lloyd, Executive Editor at GreatSchools, is an award-winning writer and editor whose work on education and family life has been published in New York Times Magazine, Salon, EdWeek, and other national outlets, as well as being featured on NPR’s Talk of the Nation, KQED’s Forum, and NBC’s Class Action. GreatSchools is a digital media nonprofit that helps millions of parents get a great education for their children, support their children’s learning, and find great schools. Every year, GreatSchools reaches more than half of all American families with school-age children, providing school information, educational activities, articles, and videos. SocialMoms is a digital media company with one of the world’s largest networks of women influencers — comprised of more than 45,000 bloggers, sites, and social media personalities with a combined social reach of more than 200 million. Founded in 2008 by Megan Calhoun, the company creates high-impact, custom media campaigns that shape perceptions and drive action. Jessica Berlinski serves as Chief Impact Officer of Adaptive Health Systems (AHS), a new double bottom line company focused on scaling Dept. of Education and National Institute of Health funded evidence-based social emotional learning (SEL) games to K-12 schools nationally. As co-founder of If You Can, she supported Electronic Arts’ founder in launching the first consumer video game designed to build emotional intelligence. Berlinski speaks on scaling SEL through technology at education and social change conferences nationally and her work on SEL has been featured on NPR and in Forbes. She has a decade of experience leading organizations dedicated to supporting the “whole child” through academics and SEL. In the third installment of our online series, Emotional Smarts: Conversations on Parenting, two experts share their secrets for banishing back-to-school blues — and setting your family up for a happy school year. Ah, the joys of summer: staying up late, sleeping in, staring at screens, eating sugar — and more sugar. After 12 weeks of so much free time, summer can feel like a long weekend gone bad. There’s good reason so many of us reach our wits’ end by the time school rolls around again. Sure, we all need a break from work and school, but experts say unlimited leisure time doesn’t make people happy. Setting goals, having structure, and working hard — these unlikely tasks actually instill a true sense of happiness. With this in mind, for back-to-school season we’re taking our cue from two happiness experts (both parents) on how to approach the school year with a renewed sense of purpose, a reduced level of stress, and an abundance of joy. Please join us for Back to Happy — our third Emotional Smarts: Conversations on Parenting Google+ Hangout — featuring two of the nation’s most seasoned happiness pros. They’ve delved into the research and discovered how to get organized for a more streamlined, less stress-filled school year. We are proud to host Christine Carter, sociologist and author of Raising Happiness, and Bruce Feiler, author of The Secrets of Happy Families. Carter and Feiler have made it their mission to unlock the secrets of happy families. They’ve been in the trenches, navigated their own parenting adventures, and taken their personal experiences and professional findings to make raising children a more satisfying, less stressful journey. Join us on Wednesday, August 27 — and jump in with your questions — for a discussion on how to make the shift from back-to-school dread to a back-to-happy outlook. Just sign up via http://bit.ly/back2happy and add your questions, then log on at 11 am PST Wednesday, August 27th to participate. In this unique forum, you’re invited to join the video conversation by contributing advance and real-time questions and comments via the Google+ Hangout page or via Twitter using the hashtag #emotionalsmarts. If you can’t make the live event, no problem, you can watch it later on GreatSchools or SocialMoms. GreatSchools, SocialMoms, and social emotional learning consultant Jessica Berlinski created the Emotional Smarts series of Google+ Hangouts that bring together some of the most insightful voices in parenting, education, and other fields to talk about developing emotional intelligence in our kids — and ourselves. Our past hangouts have included a chat about dealing with anger in the family with America’s Supernanny Deborah Tillman and Marc Brackett from the Yale Center for Emotional Intelligence, and a discussion of the benefits of letting kids fail with former NBA star Adonal Foyle and NBC parenting expert Michele Borba. For each hangout, we pair experts with divergent views to explore a common parenting theme and offer practical wisdom and tactical advice. Christine Carter, PhD is a sociologist and happiness expert at UC Berkeley’s Greater Good Science Center. She is the author of Raising Happiness: 10 Simple Steps for More Joyful Kids and Happier Parents and The Sweet Spot: How to Find Your Groove at Work and Home (January 2015). A sought-after motivational speaker on happiness, Carter draws on psychology, sociology, and neuroscience — and uses her own chaotic and often very funny real-world adventures — to demonstrate the do’s and don’ts in action. A popular blogger, speaker, and parent coach who offers online classes, she has appeared on the Oprah Winfrey Show and the Dr. Oz Show. She lives with her husband and four kids near San Francisco. Bruce Feiler is the author of six consecutive New York Times bestsellers, including The Council of Dads and Walking the Bible. For his most recent bestseller — The Secrets of Happy Families: Improve Your Mornings, Rethink Family Dinner, Fight Smarter, Go Out and Play, and Much More — he goes on a three-year journey to find the smartest ideas, cutting-edge research, and novel solutions to make his family happier. He is also the writer and host of the PBS series Walking the Bible and Sacred Journeys with Bruce Feiler; he writes for numerous publications, including The New Yorker and The New York Times. Feiler is the father of identical twin daughters. Carol Lloyd, Executive Editor at GreatSchools, is an award-winning writer and editor whose work on education and family life has been published in New York Times Magazine, Salon, and other national outlets, as well as being featured on NPR’s Talk of the Nation, KQED’s Forum, and NBC’s Class Action. Jessica Berlinski works with educational organizations to build awareness and scale impact in social emotional learning (SEL). As co-founder of If You Can, she supported Electronic Arts’ founder in launching the first consumer video game designed to build emotional intelligence. She has a decade of experience leading organizations dedicated to supporting the “whole child” through academics and SEL. • college readiness, including SAT performance and participation. Last year, GreatSchools reached more than 52 million unique visitors, including more than half of U.S. families with school-aged children. The GreatSchools Rating helps parents compare the academic performance of all public and public charter schools (and private schools where data is available). GreatSchools also provides qualitative insights from people who know a school best – through community reviews by parents, teachers, and students, and official school profiles from principals. New Jersey is the latest state where the new data are included in the GreatSchools Ratings. In recent months, GreatSchools has added the new data for schools in Colorado, Illinois, Indiana, Massachusetts, Michigan and Ohio, as well as Washington, D.C., and Milwaukee. The enhanced GreatSchools Rating now covers more than 16% of public and public charter schools nationwide. In other states, the GreatSchools Rating continues to be based on results from standardized tests, and new school data will be added as more states make the information available. Incorporating new data is one of several ways GreatSchools is working to bring rich school information and insights to parents. GreatSchools Local, for example, builds partnerships with city and state organizations to provide the most relevant and current local school information. GreatSchools also works with school leaders to highlight important aspects of a school, such as school climate and special programs. Founded in 1998, GreatSchools is a national nonprofit that helps millions of parents find great schools, support great learning, and guide their kids to great futures. Our Webby award-winning website, GreatSchools.org, is the nation’s leading guide to preK-12 schools, with profiles of 200,000 public, public charter and private schools and more than one million ratings and reviews by parents, teachers, and students. In addition, GreatSchools offers thousands of articles, videos, and worksheets to help parents support their children’s learning. Headquartered in Oakland, California, GreatSchools has local offices and programs in Indianapolis, Washington, D.C., and Milwaukee.